If you're looking for a healthy pasta dish, you can't go wrong with this one. The spinach doesn't really cook, it just gets wilted by the heat of the warm pasta. When I eat this I feel I've both indulged a craving for pasta and treated myself to something especially healthful and nutritious! Bring a large pot of salted water to a boil over high heat. Add the pasta and cook until tender but still firm to the bite, stirring occasionally, 8 to 10 minutes. Drain the pasta and transfer to a large bowl. Add the garlic, extra-virgin olive oil, salt, and pepper and toss to combine. Meanwhile, warm the olive oil in a medium skillet over medium-high heat. Season the salmon fillets with salt and pepper. Add the fish to the pan and cook until medium-rare, about 2 minutes per side, depending on the thickness of the fish. Remove the salmon from the pan. Add the basil, capers, lemon zest, and lemon juice to the spaghetti and toss to combine. Set out 4 serving plates or shallow bowls. Place ½ cup spinach in each bowl. Top with one quarter of the pasta. 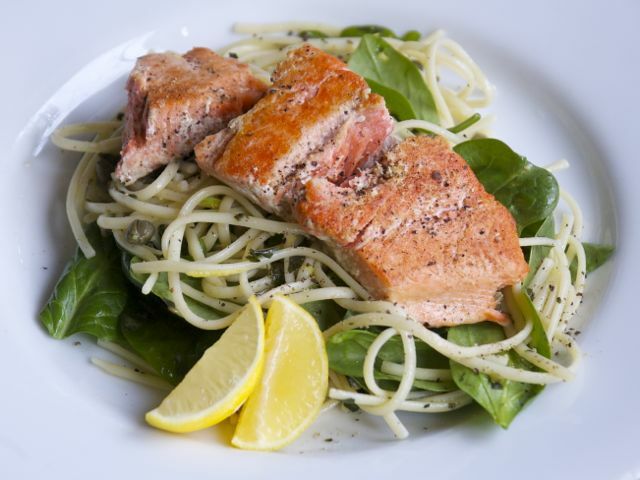 Top each mound of pasta with a piece of salmon. Serve immediately.